Looking for a monoblock amplifier for your car or truck? A high performing amplifier is key to car’s audio system. You need an amplifier that will output enough sustained power for your subwoofers that keeps cool and limits distortion. We have selected 4 of the best choices for a monoblock amplifier you can buy. Whether you are just getting into car audio or simply just need a new amplifier, there is something here for you.. The Prime 750 is the perfect monoblock amplifier for anyone looking for a high-quality amplifier to power 1-2 subwoofers. The Prime 750 has a heavy duty cast aluminum alloy heat sink, a 12 db/octave butterworth crossover, and a THD rating of < 1%. One of the really neat things with Rockford Fosgate is that they include a “birth sheet” with your amplifier that lists the rated RMS it was tested for before it left the factory. The birth sheet rating often exceeds the manufacturer listed specs by several hundred watts. The Prime 750 includes a jack for an optional remote EQ setup. It also has an onboard PEQ, what they call Punch Equalization, for 18 dB of boost at 45 Hz. If you are looking for a high quality monoblock amplifier that will last, then this product is made for you. 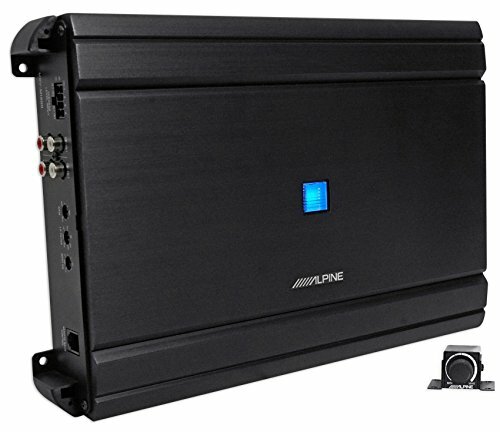 If you want tons of power then the Apine MRV-M1200 is just what you need. Capable of over 1200 watts RMS, this monoblock sub is no joke. You can easily blow your speakers with this thing if you don’t know what you are doing. For this price range you are getting an impressive amount of power, most quality amplifiers around this price are going to output less than 1000 watts RMS. The best setup for this amplifier would be two subwoofers, either two 10” or two 12” subs. Make sure they are wired for 1 Ohm to get the most out of the amp. Be careful with the gain so you don’t damage your subs. 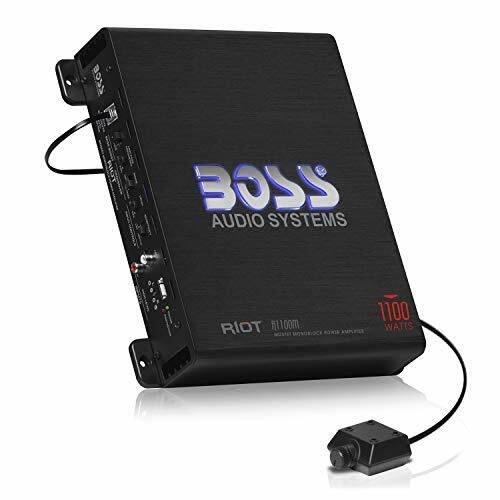 If you are new to car audio and looking to get your hands dirty then the Boss Audio R1100M is made for you. While this would be considered a budget monoblock amplifier by most, this thing still packs some serious punch. This thing can output 825 watts RMS @ 2 ohms, which is no joke. The amplifier has a few quirks, like the cooling vents being on the bottom, but the watt/dollar you are getting from this amplifier is extremely hard to beat. If you are just starting out it is an excellent choice. 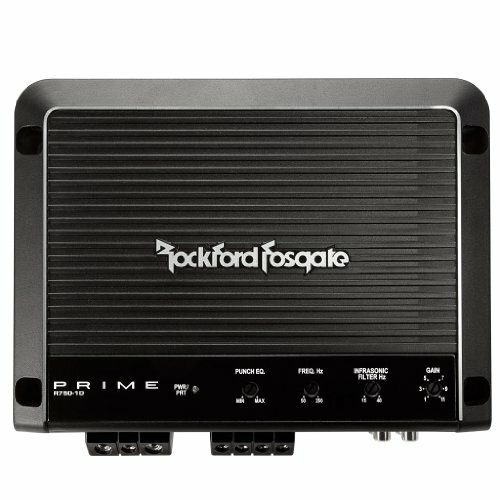 The Rockford Fosgate R500X1D Prime is another excellent choice for those looking for a great deal. 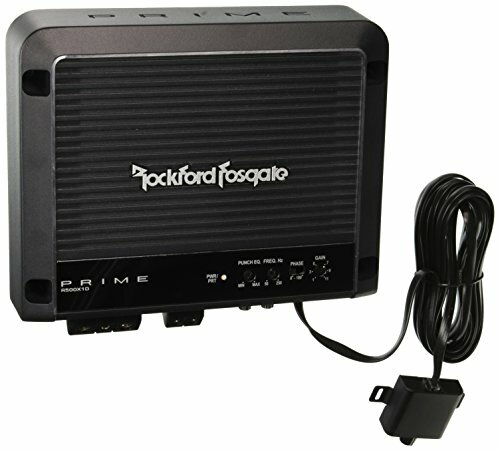 The R500X1D outputs 500 watts RMS @ 2 ohms, comes with a heavy duty cast aluminum heatsink and a wired remote control. This monoblock amplifier is perfect for anyone who only needs to power a single woofer. As mentioned earlier, Rockford Fosgate monoblock amplifiers come with a birth sheet, that lists the rated RMS it tested at before leaving the factory. Often this will be more than a hundred watts higher than the manufacturer listed rating, so you know that you are getting a high quality product. A Car Amplifier can be thought of as the heart of your car’s sound system. The amplifier is what pumps power to your speakers and power is what they need. If you are looking to install aftermarket speakers in your car, especially subwoofers, then you absolutely need a quality amplifier. The OEM amplifier in your car stereo is not going to be able to handle the power that a subwoofer requires. Before you buy an amplifier you need to know a few terms and metrics to evaluate them. Here we go over the most important ones. Power Rating (watts RMS) – The single most important metric you need to know is how much power your amplifier outputs. RMS stands for root mean squared, which is a fancy way to measure the sustained power rating, as opposed to peak power rating. Peak Power Rating (watts) – The peak power rating simply describes the maximum instantaneous output of the amplifier. You need to make sure you do not confuse the peak power rating with the RMS power rating. This metric is not very meaningful, as the ability to output a high amount of power for a very short amount of time is not very useful. Unfortunately, often the peak power rating will be listed promptly and not RMS (because RMS will be much lower), so always double check which metric you are looking at. Cooling – Cooling is very important for amplifiers, especially ones that sit all-day in your hot car. A hot amplifier is going to be less efficient, output less power, and strain your car’s electrical system. One of the main differences you will find between entry-level monoblock amplifiers and high-end monoblock amplifiers is the cooling. Lower quality amplifiers will not have proper cooling and if you are not careful, they are going to shutdown often when their thermal protection circuit kicks in. Channels – Since we are talking about monoblock amplifiers we don’t need to worry about this. As monoblock amplifiers obviously only have one channel. This does not prevent you from hooking up multiple subwoofers to one channel though. Distortion (THD) – Total Harmonic Distortion. This is how much distortion is produced by the amplifier. For car audio, this number is not as important as it would be in home-theater audio. Just make sure whatever you buy has a reasonably low THD rating. Never buy an amplifier that produces more than 1% THD. Ohms is the measurement unit for resistance, it describes the resistance or load on your amplifier. The higher the resistance, the more work and thus more power will be required. So an amplifier that produces 400 watts @ 8 ohms is going to be able to produce 800 watts @ 2 ohms and 1600 watts @ 1 ohm. Keep in mind that just because your amplifier can produce the power does not mean it is rated for it. Never run your amplifier at loads it is not designed to handle. The voice coil in your subwoofer determines how much resistance your amplifier will have to deal with. If resistance is too low your amplifier may not be able to handle the amount of power it will produce and will likely shutdown to avoid overheating or even catching on fire. In an ideal world you would always run subwoofers at the lowest possible resistance. The problem is most amplifiers start running into problems at lower levels of resistance even if they are listed at being able to handle it. If your amplifier can’t dissipate the heat quickly enough from the power load at 1 ohm, performance will be reduced. At 1 ohm your amplifier will also have less control over the power output than it would at 4 ohms so there will be more distortion. Since we do not live in an ideal world, generally the higher resistance you run your speakers at, the better they will sound. You likely won’t find much benefit in going any higher than 4 ohms for car audio. If you have a high quality amplifier you may not have any issues running it at 1 ohm. But make sure the amplifier is really designed for that before you do it. Generally, an amplifier that can handle 1000W at 4 ohm will be much more expensive than one that can handle 1000W at 1 ohm. This is because 1000W at 4 ohms would (in theory) be 4000W at 1 ohm, so this amplifier is doing a lot more work than the one running at only 1 ohm and requires a more robust design and circuitry. Keep in mind that just because your amplifier can produce the power does not mean it is rated for it. Never run your amplifier at loads it is not designed to support.